Our kits appeal to crafters of all abilities, including those just starting out, and anyone looking for an imaginative gift. However, you could double the happiness by making the Bright Lavender Houses yourself and giving them as a present in our signature reusable box! Each House can be personalised with your choice of patterns, colours and stiches or could even be embroidered with names or dates. All Corinne's kits include everything you need (with the exception of scissors!) 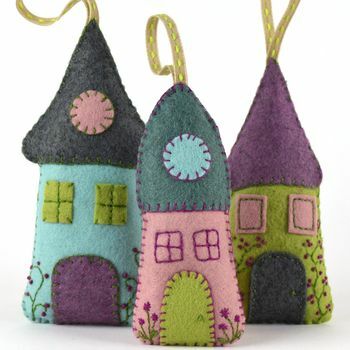 to realize the project including soft wool mix felt, embroidery thread, a needle, toy filling, ribbon and lavender. All our kits are wholly sourced and made in Britain (except the dried lavender which is French!) using recycled and recyclable materials where we can. This product is dispatched to you by Corinne Lapierre.